In this installment: 4-seed Wisconsin (26-9) vs. 1-seed Syracuse (33-2). I say this with a heavy heart, because I was reared in upstate New York rooting for Syracuse, but the town is a complete dump. It’s literally one of the most depressing American places on earth, and I’m pretty sure it’s not safe, either. When I was a kid, just stepping foot on South Salina Street, for a fraction of a millisecond, was enough to put your life in danger. I once spent six months lying in a bed with severe gout just because we drove on South Salina for like 30 seconds. Rough days. Also, Syracuse is in a weird weather climate that is perpetually at the nexus of a rain front and a cold front, ensuring that is always damp, frigid, and dark in the city proper. The campus is lovely, mind you, but when the two top tourist attractions in a town are the police station and the lost and found at the McDonald’s PlayPlace, you know something wicked is afoot. Jim Boeheim is now third on the all-time career wins list with 889, and has been to three national title games with one championship. He’s also won nine regular-season Big East championships and five Big East tournament championships. His career winning percentage is .746, and he looks like a guy who shows up at the newspaper office to complain that his delivery was 10 minutes late. Bo Ryan was a four-time national champion at Division III UW-Platteville in the ’90s, and has led the Badgers to 11 straight NCAA tournament appearances since he took over in 2001. He’s won three Big Ten regular-season championships and two Big Ten tournament championships while compiling a win percentage of .728. His team has never advanced to the Final Four, though, and he’s made the Elite Eight just once, in 2005. He looks like someone who would burn the newspaper in front of a delivery boy in an attempt to steal his soul. Syracuse are called the Orange, which is both a color and a fruit, and its mascot is a soft, round orange named Otto. They were formerly the Orangemen, which was apparently not a reference to Scotch-Irish Protestants, and they wanted to make that clearer (and go gender-neutral in the process) by shortening it in 2004. The Badger is a crazy badass, as we all learned this year thanks to LSU’s Tyrann Mathieu. I believe we all know who’s getting this point. Even without Fab Melo, Syracuse owns a talent advantage here. The Orange are led by first team All-Big East senior forward Kris Joseph, who averages 13.8 points and 4.9 boards per game, and Scoop Jardine, the clutch senior guard (second team All-Big East) with the 23rd-best assist rate in the country. Boeheim has crafted a balanced scoring attack, with eight players averaging at least seven points per game (one of whom, Melo, is ineligible). Dion Waiters, a 6-foot-4 sophomore, has one of the best steal rates in the country and is the only other Orange player in double digits, with 12.7 per game. Wisconsin may have the best player on either team in Jordan Taylor, a 6-foot-1 senior and first-team All-Big Ten selection scoring 14.7 per game and dishing out four assists. Ryan Evans, a 6-foot-6 junior, and Jared Berggren, a 6-foot-10 junior, are the only other players averaging double figures in Wisconsin’s purposefully slow offense. They’re also two of the team’s leading rebounders, grabbing 6.8 and 5.0, respectively. Neither team is great from beyond the arc, but Wisconsin’s Josh Gasser is the most likely to light it up, averaging 45.6 percent from deep. As usual, Ryan has milked the most out of his players, and has had some legitimate talent to work with. But Syracuse is stocked with gifted athletes, and Boeheim’s tournament rotation boasts seven players whose collective ability will outshine Wisconsin. Despite what you might think, Syracuse tends to play at a pretty slow pace (203rd in the country), which probably means they won’t be overly bothered by Wisconsin’s dramatically slow pace (344th out of Division I teams). Nevertheless, anyone who faces Wisconsin is prone to frustration, and Syracuse has a well-known tendency that might aggravate the situation — the 2-3 zone. That defense has been Boeheim’s trademark throughout his career, but the weak spot of any zone is rebounding. Although Syracuse has a very talented crop of big men, it is 341st in the country at protecting the defensive glass. The simple explanation is that it’s tougher to box out an entire team when you’re not guarding a specific man. Those numbers aren’t a surprise, and it’s a trade-off Boeheim is very willing to make. With the right personnel, the zone defense will be good enough to overcome that Achilles heel, and indeed, this year’s Orange boast the 15th-most-efficient defense in the country. The Kansas State win in the second round provides a good example — the Wildcats grabbed 22 offensive rebounds to Syracuse’s eight, and it didn’t matter. But when Wisconsin gets an offensive board, you’ve just lost 35 seconds. The Badgers aren’t great on the offensive glass, but the zone tends to make mediocre players look like rebounding monsters. Ryan’s teams will always work the clock to the extreme, and if they hold an early lead, a few offensive boards here and there could frustrate the Orange into a sloppy game. When you consider the fact that the Badgers will probably be very effective at nullifying the Syracuse fast break (if they can do it in Chapel Hill at the Dean Dome, as they did in a 60-57 loss November loss, they can do it on a neutral floor against a slower Syracuse team), and that as a disciplined team with decent 3-point shooting capability they’ll have a puncher’s chance against the zone, this looks like a terrible matchup for the Orange. I’m giving this one to Wisconsin. Before the tournament began, this would have gone squarely to Wisconsin. 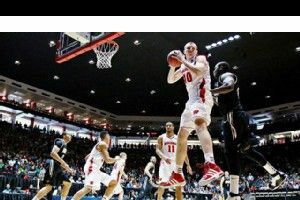 Ryan’s middling success in the tournament gave the Badgers a nobody-believes-in-us factor, and roughly 95 percent of America picked them to lose to Vanderbilt in the Round of 32. They’re also an incredibly boring team to watch, so nobody really likes them outside of Madison. (And by the way, that fact is only exacerbated by the Badger fans who routinely insist that the style is somehow noble or even brilliant, thereby making themselves the most boring fans in college basketball.) There’s a lot of potential unity there. Quick side note about that tournament success, or lack thereof: A reader e-mailed me this week to take issue with the idea that Wisconsin hasn’t fared well in March Madness under Ryan. He pointed out that the Badgers were one of only nine teams to have five Sweet 16 appearances in the last decade. On the other hand, what I saw was that of those other eight teams, seven had made Final Fours in that time span, and the other, Xavier, had two Elite Eight appearances to just one for Wisconsin. Neither the reader nor I was wrong, but it gets back to a question of perspective and expectation: Is Bo Ryan a hero for leading his team to the top of the second tier, or a villain for being the worst of the first tier? As for Syracuse, they had the look of paper tigers coming into March. Then Melo was ruled ineligible, and everyone jumped off the bandwagon with both feet. I know I picked them to lose against Kansas State even before the news, and everyone else joined me in time for Thursday. The loss of Melo, the Big East defensive player of the year, obviously hurts Syracuse in the rebounding department, which is a weakness anyway, but we all may have made a critical error in judging just how important he was to the Orange cause. His 8.3 points, 5.8 rebounds, and 2.9 blocks in 25 minutes per game are nothing to sneeze at, but neither are they a death blow to one of the two best teams in the country. But try telling that to the likes of us. Suddenly, Syracuse found themselves as maybe the first 31-2 team in history with their own version of the nobody-believes-in-us mojo. Even after two wins, I still don’t think any of us actually believe they can win a national championship. To me, it’s a foregone conclusion that Syracuse has the better athletes, but that Wisconsin will be able to slow the break and frustrate them to some extent. Exactly how deep that frustration goes will depend on two factors — offensive boards and 3-point shooting. If the Badgers can produce second chances and hit their shots from deep, this has the feel of a nightmare game for Syracuse. If they find themselves in a close battle, will they be able to grind their way to an ugly win? If you couldn’t tell, I’m very torn here, and picking a winner is essentially like trying to be a fortune teller. Ken Pomeroy has the game going to the Badgers by one based on his metrics, and in the absence of a crystal ball, I should probably defer to the master. But Melo or no Melo, there’s a reason the Orange have won 33 games. Syracuse survives a bad scare with two James Southerland dagger 3s near the end.